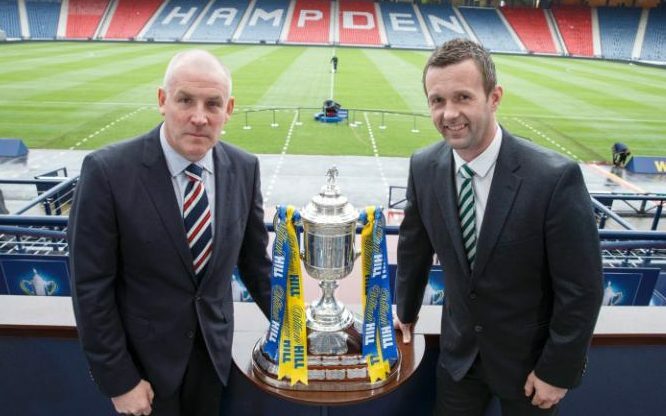 It goes without saying tomorrow’s Old Firm clash has more riding on it than the last one. February 2015’s encounter at the same venue taught fans of both sides little – we knew Rangers were garbage and running around in circles, and few fans of a blue inclination expected much more than a loss. That the display bordered on embarrassing, even if the score did not, was neither here nor there. The entire occasion was a damp squib and as weak an Old Firm clash as seen in recent memory. Tomorrow is different. Tomorrow is very different. This is a Rangers going places – a brilliant manager, universally respected, who has overhauled the entire Club from root to tip while coasting his maiden season in Scottish football will take his Ibrox side to Hampden for his first Old Firm clash against a Ronny Deila Celtic which has evidently stagnated and looks anything but as assured as it should. Rangers are promoted, they are a Premiership team once again, as they should be. Celtic should have had that division wrapped up months ago and yet they do not even have a double digits lead over the infinitely poorer Aberdeen. Many questions are being asked of their Norwegian manager, and of their underperforming side which has been dumped out of Europe a world record five times in two seasons. The pressure is all on Celtic, and they know it. It is why a victory tomorrow for Rangers would be colossal. Doubt permeates the Parkhead air, and Rangers supporters have suffered a frankly incomprehensible amount over the past four years; to now overcome Celtic and their supporters who have certainly ‘had their fun’ over the past half decade or so would be not only a gargantuan victory on the pitch, but a behemoth of a triumph off it, in more ways than just beating the old enemy. The nonsense Rangers supporters have tolerated for years has gone beyond simple banter and into the realm of relentless hate and bitterness – and getting one over on the source of such unwarranted ridicule would mean an immeasurable amount to all those of a red, white and blue persuasion. Make no mistake – while Rangers are without three key players (O’Halloran, King and Forrester) and while Celtic are favourites on papers, Warbs’ men will do everything in their power to give their supporters an afternoon to remember. Naturally, a defeat does not mean a huge amount in the grand scheme of things; Celtic are expected to win. But that is the point; the expectation is on them, and Rangers have literally nothing to lose. But win? Win and it means everything. It's not quite true that rangers has nothing to lose m there's the Scottish cup & a place in Europe at stake. we will do our very best, and the most important thing is we are back up where we belong and lets get on now with building a good strong team, in king out trust WATP.